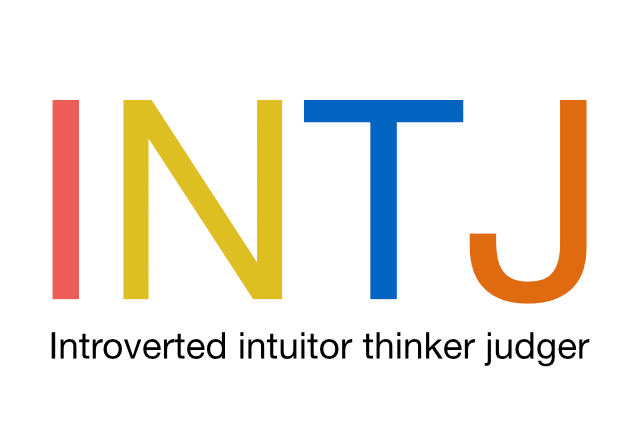 The Judger element of the Myers Briggs INTJ personality type means that Thinking is extraverted with this personality type and Intuition is Introverted. The preference for them in how they make decisions and come to conclusions (Judging) is through Thinking rather than Feeling. Extraverted Thinkers primarily want to understand and organise the external world. They want everything to make logical sense, and have very little patience of unproductive activities. Their personality dynamic is therefore Introverted Intuition with Extraverted Thinking. Their third preference is Feeling and their inferior function is Extraverted Sensing. demonstrate long term implications for outcomes and debate meanings and global issues. allow room for independent study and intellectual reading, acknowledge their competence. I am currently slightly Introvert over extrovert which surprised me a little as I thought I was more extrovert than I am until I looked at this. I am certainly not a hugger, in fact I cringe a bit even when family members or friends try to embrace me. I am a very good listener, which is which I believe I have taken to counselling and often like to have alone time, to watch tv or study. I do generally think before I speak, talking to myself internally and working things out as opposed to just blurting the first thing out. On the extrovert side of things, I do tend to multitask and at college I am at the forefront of activity. I enjoy getting the whole group involved in the required activities as I am comfortable in groups and working within them. Whilst I am working on project’s, I sometimes forget to stop and get clear on what I want to do as get engrossed, and may explain why I can lose direction whilst doing so. I currently have a moderate preference of intuition over sensing. I struggle with facts and figures, maybe because my mind wanders onto other ideas too easily, and much prefer looking at how things relate to each other. With my studying, although encouraged to read books, I find it hard to learn that way, so skip through them looking for the information relevant at that time. I am much more future orientated, although I sometimes reflect on the past, I don’t dwell on it, and currently trying to invest some time on Mindfulness in order to practice being in the here and now, something that I haven’t been particularly good at, and I am at heart quite an impatient person. I love ideas more than hard facts, fantasizing and future pacing what I want from the future, and I am more imaginative than practical. I do however like to know the facts, even if I struggle with them, I am a very hands on person, getting my hands dirty and working out how best to get the job done. I have a slight preference of thinking over feeling. I like to think of myself as a fair and truthful person and doesn’t hesitate to tell people when I disagree with them. I think things over and talk to myself in my mind, looking for clarification when I am unsure of things. I am definitely much more auditory digital than I am kinesthetic, but I an empathetic person, and can sometimes take things personally, especially if criticised. I have a slight preference over judging rather than perceiving. In the group projects I get involved with at college, I am very flexible and open to others ideas, getting the group all working together, I am always on time, in fact I make a point of arriving early, and hate it when people are late, although it is fair to say I am not as organized as I could be. Although I don’t make lists, I do have a list in my head of what I need to do, but am a multi-tasker so can be easily distracted. How do I know? I’ve been ‘Myers-Briggs’ed at work before. Judging by the scores I’m clearly an Introvert and Thinker, not so much a Judger or Intuitor. My characteristics tend to match the personality traits suggested by Myers-Briggs. Also I could relate to the definitions and examples in the profiles. 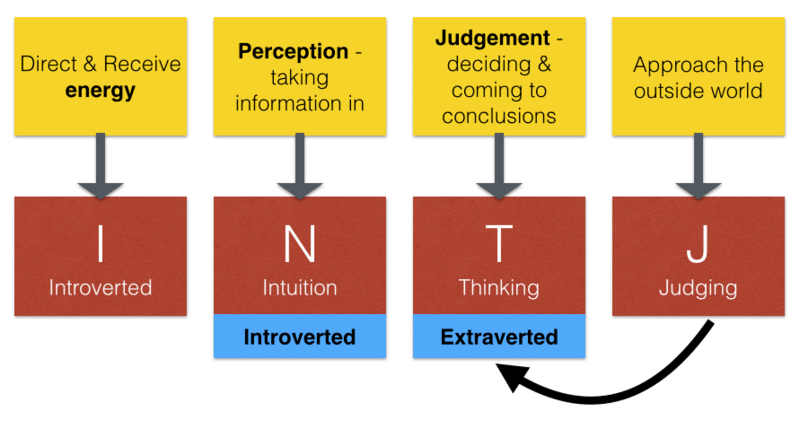 I do realise that I seem to have built a box for myself by stating that I’m an ‘INTJ’. Actually I do vary as the situation demands. In work I do act like an Extrovert when needed. My work often requires direct, immediate action to be taken and I’m comfortable with that, in fact I get a buzz from it. I do exhibit, or have exhibited, most of the possible combinations during the working career. I’ve also had a ‘Strength Deployment Inventory’ personality test. The results are presented differently but the underlying message is the same. I’m typically a reflective, balanced person who becomes much more directive when the situation demands it. Me: Introvert – How do you know? Well first of all just listening to your explanation of an introvert got me laughing.. I really could relate to a lot of the things you mentioned. That being sad, I can be an extrovert when needed, as this is something certain situations has required from me. (family, job etc.) So, I can be an extrovert when needed .. but never really enjoy it. I am the opposite as I prefer fewer friends, prefer to not to socialize with huge crowds of people (allthough I have no problem with giving presentations in front for huge audience) I am internally focused, prefer to be alone while gathering my thoughts and regaining energy, I observe/think before I speak and enjoy my “alone time”. Me: Intuitor – How do you know? I enjoy to see things from an abstract point of view, am future orientated and focused, enjoy puzzels, how things work and relate to each other, I often see the big picture and have visions of how things can be. I normally do good on exams and tests and often turn to my intuition if uncertain of facts provided to me. Me: Thinker – How do you know? I firmly speak my mind and let people objectively know when I disagree. I must have clarification, and can easy make decisions, based on logic. I can reason between what subjective (feelings) and objective (logical) opinions. As a manager I noticed I could make tough but necessary decisions, which were necessary in my business that some Feelers could get emotional about. Me: Judger – Me: I know because I like to have things in order. Each thing has their own place. I like a plan, I am strictly organized and I like structure. I don’t enjoy surprises, unless they are gifts. I have a need for closure before moving on, and I hate it when people come late, or do not revert back on time as agreed. My father is an introvert and displays few extravert traits. He prefers to be alone and is seemingly perfectly happy to be left alone with his own thoughts and ideas. This trait is consistent throughout from my earliest memories. Now hard of hearing, he often chooses to simply switch his hearing aids off and ignore the phone and door bell etc. My father is difficult to engage in conversation and usually has nothing to say; he has no close friends and has completely lost touch with his siblings and connected family. He enjoys being alone and has always had difficulty when socialising; often positioning himself on the fringes if obliged to attend social functions. He has become ever more introverted since he retired some years ago; when at work he was able to get by with others by pretending to be reasonably outgoing…this was however a mask. He loves to partake alone in reading and puzzles; concentrating intently on crosswords and Sudoku etc. He is not carefree but is self sufficient. He is a non hugger. I have identified my father is an Intuitor, these traits being slightly more prevalent than his Sensor traits. He can be quite abstract in his thinking and likes puzzles; seemingly enjoying the discovery of correlation, function and connection He tends to think of things in the future tense; liking to consider the relationship between differing ideas and the bigger picture. He is very deep but always seems open to change and new possibilities. This aside he does not tend to fantasise, prefers facts and is orientated to visual phenomena – he adores watching television, films, reading newspapers, magazines and media. My father values authority and loved his job of work before retiring many years ago. He worked with mechanics whilst in the army and was adept at this vocation. Despite being withdrawn he can be shrewd. I would ascertain that my father has a bias for being a Thinker. He is often disassociated and can be firm minded, extremely stubborn and head strong…but objective. He is willing to tell people when he disagrees with them. Further to this he seems to have no difficulty when making decisions; there are however times when his decisions lack logical reason. He does not particularly extend himself to others and does not display softness; he is not overtly gentle minded but was extremely kinaesthetic during his younger years. When the mood suits him he is willing to go with the flow; on the other side of the coin when his mind is made up he is an immovable object…and will not be swayed. With regard to adaptive response my father is a Judger; he has a liking for organisation, order and sequence and does not like surprises or adaptation to set routine/plans. As a creature of habit I would estimate that he likes to adhere to fixed patterns; punctuality is important to him. He does make lists and likes to follow instructions; such plans are very important to him and he has a tendency to dislike spontaneity. He is not easily distracted from anything that has gained his attention. My father has never displayed any tendency for exploring his boundaries or unknown territories. He is most likely to show affection to those that he cares about through generosity of action, i.e. he will be inclined to do kind acts, but never share kind words of affection or support.